TMI dock bumpers are built with long lasting quality and durability! Laminated Bumpers are constructed of recycled truck tire pads compressed between steel angles and secured with 3/4″ steel tie rods. The laminated type protects both trucks and docks and is the most commonly used bumper. Our complete line includes all sizes from 4-1/2″ to 12″ thick in horizontal, vertical, and extra-length styles. 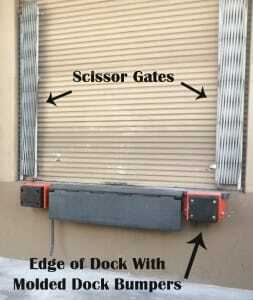 Gussets for lower loading docks and special sizes are also available. 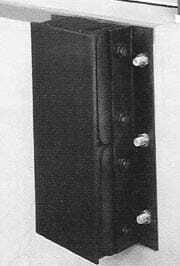 Where maximum protection is desired, Steel Face Bumpers with a 3/8″ thick steel front plate should be used. This will absorb more shock and abrasion than the standard laminated bumpers. Standard sizes are 5-1/4″ to 12-3/4″ thick and all horizontal and vertical styles. 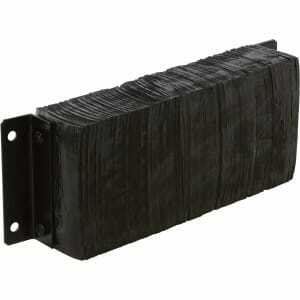 Molded Dock Bumpers are manufactured using reinforced rubber in a variety of shapes and sizes. These solid, durable, one-piece bumpers are smooth, attractive, and will not harden or be affected by weather. The most popular models are the “T”, “L”, and “R” styles. We carry a full line of standard sizes. Special shapes and sizes can be fabricated – Call for details.